Candice's Beauty Blog! : Julep October box! I can't seem to find daylight to take my own decent pictures lately, sorry! What a great surprise to find that between the 24th and 27th, someone signed up using my referral link and they sent me a free box without me really knowing! I don't know what happens if the person unsubs before 30 days... anywho, for now, I have a free Julep box. Sabrina, described as a zesty orange shimmer crackle. I tried the crackle and it works! I guess that's not surprising to anyone but I'm a crackle newbie and I thought it was really cool. It didn't work on a bare nail though. Nail polish isn't really my thing so I simply can't buy all of the Julep boxes, it would be too much of a budget hog for the worth of these items for me personally since mostly they would just sit there, but I do love Julep. They have a really great program since it allows to pick a profile, allows to skip, has a great referral program and they are so attentive. Like their attention to Canada in the July box, this box being a bit Halloween themed, the extra goodies they include and something most recently that impressed me was how they listen to their customers. Right away when they got negative feedback about this month's choices all having crackle in them, they made a separate choice box to offer that had no crackle polishes. I also heard about a problem with brushes in the past that they dealt with nicely. Not only sending them when customers complained but since it seemed to be a whole batch of weird brushes, they sent one out to everyone (at least that's what I believe I heard, I was not a customer at the time). 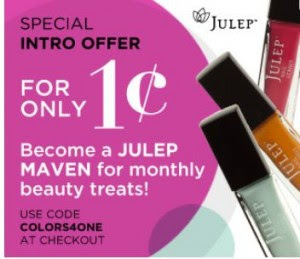 Just saw online that there's a new promotion, probably more temporary than the regular 1 cent promotion that would get a new Maven 5 polishes for 1 cent! Don't know if it's still working and don't know if it includes a product like the regular 1 cent box would but the code is: MAVENNOW if you want to try! Oh I missed that one for a penny. I got an email about the same promo for $4.99 and went for that. Like you I love julep but the price is a little steep for it to be monthly for me. Love the colors you got.